Glamping is a step up from camping. It was nice to stay at the Sou’Wester Vintage Trailers as a way to get our “camping” fix withougt having to sleep in the dirt in the bitter cold. When you go glamping, you are almost always guaranteed not to sleep in the dirt. The rest of the details can vary quite a bit though. A glamping site may have running water, may have solid walls, may have an inside toilet, may have a private shower, may come stocked with plates, silverware, pots and pans, may have a cooking method (microwave or stove), may have fridge, may have bed with mattress, may just have hard surface you have to place a sleeping pad on, may have some source of heat (usually do), and may have other amenities on site. You get my point. 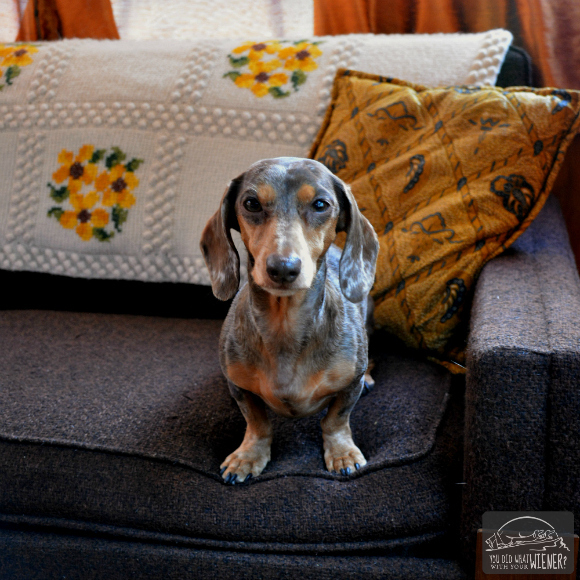 Gretel and I were given the opportunity to check out the Sou’Wester Vintage Trailers earlier this month by Glamping with Pets. 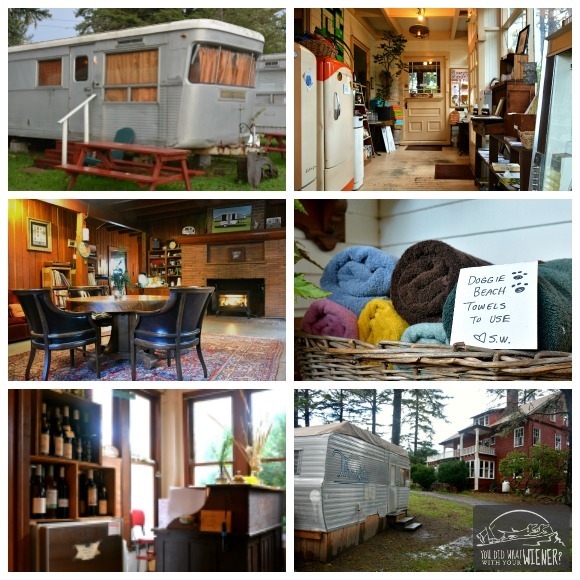 The glamping trailers are a 5 minute walk from the Pacific Ocean in southwestern Washington. There are many trailer options to choose from on site. They range from “Campers” (no toilet, but yes stove & running water) to “Standard Park Models” (kitchen, bathroom, full living room) to “Family sized Mansions” (kitchen, bathroom, full living room, and a ‘second bedroom’ – aka 2 single bunk beds). Gretel and I stayed in the “Jet”. It’s one of the Sou’Wester’s “Standard Park Models” with a full-sized bed, refrigerator, kitchen with stove and sink, bathroom with shower, small dining area, and living room. It was decorated in a vintage 70’s style with orange and copper accents. There were many thoughtfully selected trinkets on the shelves to give it this eclectic vibe. Most importantly for me, there was Wi-fi! The Wi-fi was important for me because I used our stay as a “writing retreat”. Since I was trying to get a lot of work done, and there were only short breaks in the rain, we didn’t get out and explore the property much. However, there was a sauna, outdoor kitchen, honor-system store, honor-system thrift store, and communal hang-out area with fireplace and record player. Our trailer had a record player and small TV/VCR so I could have borrowed records to listen to or movies to watch. They were very thoughtful about details and even supplied a basket of towels for drying your dog off after a romp on the beach. They also had live music on Saturday. Our stay wasn’t all work though. We did manage to catch a few breaks in the rain. Saturday morning we walked to the beach from the trailer. In the afternoon we took a drive to check out Cape Disappointment State Park. It’s at the mouth of the Columbia River where it meets the ocean. The area is notorious for storms, treacherous currents (the park gets its name because Captain John Meares failed to cross the river bar in 1788) and is home to two lighthouses. It was rainy on the visit, and so windy that seafoam was blowing up the bluff from hundreds of feet below, so Gretel stayed in the car. It was pretty cool though. Sunday we drove a couple of minutes down the road to Long Beach. The Long Beach Peninsula is known for its continuous sand beaches on the Pacific Ocean side – 28 miles (45 km) in extent – and is claimed to be the longest beach in the United States (source). From 1889 to 1930, a narrow gauge railroad called the Ilwaco Railway and Navigation Company ran up the whole peninsula. In the evening, I ordered food to go from The Depot restaurant next door. It’s literally in the historic building that used to be the Seaview train depot. It’s a nice place and I think they’re not used to people getting food to go but they made an exception for me since I called right when they opened, before the crowd came in. 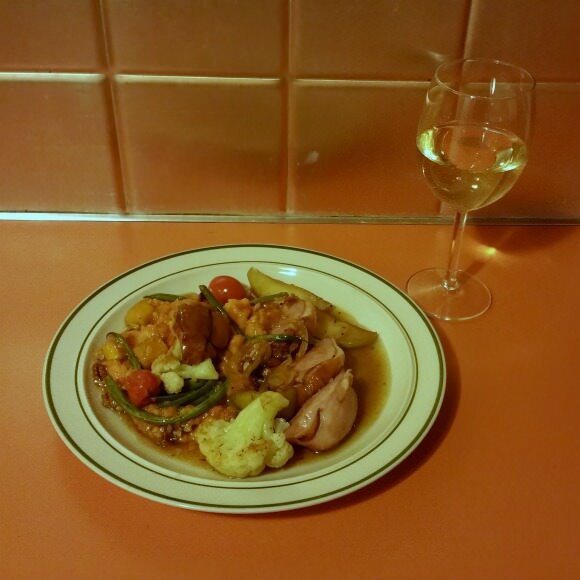 Their Autumn Duck was one of the most delicious meals I’ve ever eaten (everything is better when you are roughing it but I’m not kidding). Anyway, the whole trip was great and I’m thinking about going back with my hubby and Chester next spring. You can check out the Sou’Wester Vintage Trailers on Glamping with Pets or discover other dog friendly glamping sites around the world. If even glamping is to “roughing it” for you, you’ll also find many dog friendly cabins, bungalow, and villas on their site. If you are looking for something in Washington State, check out my comprehensive list of Dog Friendly Glamping Yurts, Cabins and Huts in Washington. 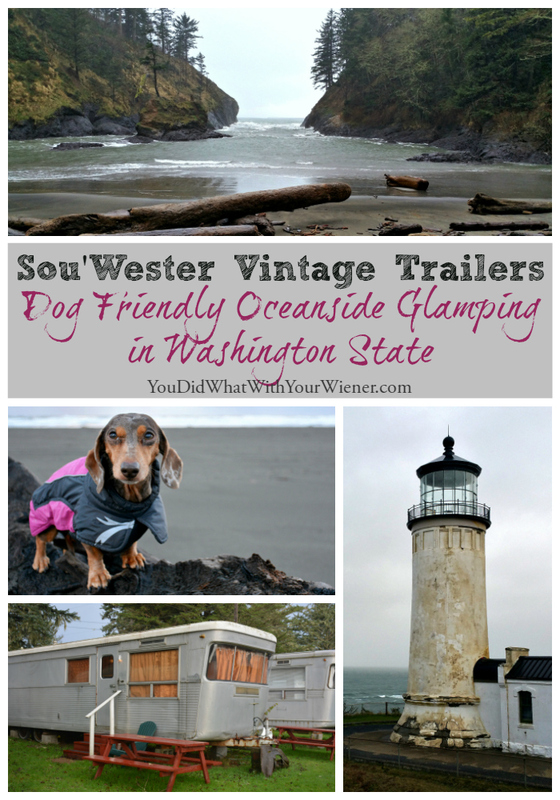 Disclosure: I received a free stay at the Sou’Wester Vintage Trailers from Glamping with Pets in exchange for sharing my experience. It didn’t influence the review and my feelings about the place though. I wouldn’t lie to you. Thanks for trusting me on that ???? How can I join? I tried to join on the Facebook page, but none of the links worked. Hi Jim. What is it you’re trying to join? Whose Facebook page?